Here I am, writing away, trying to turn raw ideas into entertaining fodder, and–What’s that? There’s a new book listing? Oh! Well, then. Let’s talk about that. Ladies and Gentlemen, allow me to introduce the cover for The Blood-Dimmed Tide, book 2 of The Remembrance War. Nice, isn’t it? I’m really happy with this design; there were three possibilities, and while I really liked them, there were two that stood out. The one I liked most had a couple of issues, which my editor, quite fortunately, agreed with. The art team worked with it, and now it’s basically perfect. The Bood-Dimmed Tide is scheduled for release in February 2020. But it’s still not ready, so maybe I should get back to writing it! 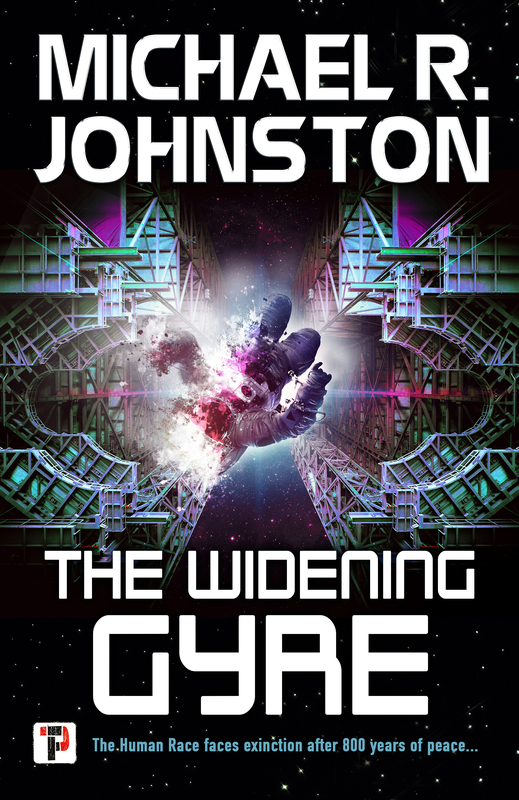 The Widening Gyre Now Available For Pre-Order! Exciting news! The Widening Gyre, my debut novel coming in March from Flame Tree Press, is now available for pre-order (in some formats)! NB: Only the hardcover, paperback, and non-Kindle ebook are currently available to order. If you want it as a Kindle book or an audiobook, you’ll have to wait a bit longer to pre-order. Hardcover, Paperback, and Ebook can be ordered directly from the publisher. Paperback can also be ordered from Amazon in the US. All other formats WILL be on Amazon US eventually, but of course you can also order them direct from the publisher. Amazon UK has both the hardcover and paperback available. You should be able to preorder from book stores, as well, but I’m not sure if it’s percolated that far yet. The ISBN for the paperback is 978-1787581432. That might help. If anyone does successfully preorder from a brick & mortar, please let me know! So far the book isn’t on B&N.com, Kobo, or iBooks, but as soon as it is I’ll post that information. Yesterday, I received an email from my editor. Anyway, I thought it was going to be my edits, but no–it was cover design ideas. He presented me with two, told me his preference, and asked for mine. I’ve thought about this moment a lot, even before I made the sale, and I’ve always known it would be a stressful thing. For one thing, I’d been thinking about possible designs for a while. Most of my ideas were, I knew, unobtainable. Further, while some publishers will ask the author what they think, the final decision is the publisher’s. More than one author has hated their book cover. I was prepared to join them, but hoping for better. So it was with some trepidation that I clicked on the files. And then I smiled, because both designs were fantastic. I really loved the artwork on one of them, but it doesn’t quite fit this book’s feel or themes as well as it might. But the other design is thematically perfect, and dynamic. It’s eye-catching and has a great tagline. I’m happy. The design may change, in small or even large ways, between now and finalization. But for now? I’m totally pleased. A few days after I sent my acceptance of the terms the publisher was offering, they sent me the boilerplate for their contract. A boilerplate is standardized language used in contracts. Every publisher has their own. It’s essentially the same thing you’ll see in the contract. This is where the negotiation happens. So I read over the boilerplate, and googled like crazy for a couple of days. The contract lays out what you’re paid, when it happens, and how royalties are calculated. It isn’t the same for all formats–there’s separate rates for hardcover, paperback, ebook, audiobook, and then rates for remaindered books, and book club editions. It also lays out how much the author gets for the sale of translation rights, film/tv rights, audio play (as in radio) rights, etc. Most of those, I imagine, will never be used, but they’re enumerated in the contract. The contract lays out what happens if I don’t live up to my obligations by delivering the book by the due date (I’ve already turned it in, since it was complete when I submitted it for consideration), and how any disputes between the publisher and I will be dealt with. I don’t foresee any of that being an issue; it’s all pretty straight-forward. It all looked great, so I signed it. I’m sure in the old days this was done primarily via mail, but because the 21st century is amazing, I signed it just like I signed a lot of my mortgage papers–online, via DocuSign. Thanks to the iPad’s abilities, my finger-signature even looks like my actual signature. Within half an hour of signing, I got a copy in my email, signed by me, my editor in New York City, and the head of the publisher in London, UK. I love the future. Of course, what I know now is that I should have at least tried to hold on to the tv/film rights. When I signed it I didn’t really care, because in the unlikely event of a film rights deal, I’d get the majority of the money. But after signing, I learned from a few sources, most eloquently Jen Udden and Bridget Smith, in their podcast Shipping & Handling, Episode 47, that I should have asked for those rights to remain with me, partly for monetary reasons, but also for reasons of control. Udden and Smith also recommend keeping the rights to graphic novels, and merchandising. They also suggest that if you must give up those rights, try for more than 50% (which I got without haggling, because my publishers are good people). Again, this will likely never come up. Film deals are exceedingly rare. I’m not sure how my publisher would have handled that–my understanding is that most of the big houses just grumble and give up the grab at those rights–but, in my case I don’t think I was harmed in giving up those rights even if there is interest further down the road. But it’s a data point new writers should have. In any case, I don’t actually regret giving those rights up, mostly because the odds of it ever becoming an issue are pretty much against me. But it’s something I’ll keep in mind going forward. And finally we come to where I am in the process: Waiting. I expect the first-round edits and copyedits in the next 2-3 months. Publication is tentatively scheduled for March 2019. I’m working on book 2, which has not yet been signed, and will send off the proposal for it when I’ve got a couple of chapters done (it’s already been plotted and a synopsis has been written). I’m also doing a lot of research on conventions and other avenues of writerly book promotion. All while trying to give my kid a fun summer and also plan for the next school year. Ever since I got the offer on my novel, I’ve felt a mix of exhilaration and crushing fear. I thought it might be fun to write a series of posts explaining the process and how I’ve felt during it. I’m going to call this series “What it’s Really Like,” because when we’re working towards publishing professionally, many of us get an idea in our head of what it will be like, and while I’m only completely aware of my own experience, I’m willing to bet a lot of it is universal. My experience is mine alone. While I know authors who are further along the path of pro writing than I am, some of them significantly so, and many of them have reported similar experiences, there are also some differences that are pretty important. I am publishing through a small press. By definition, this means my experience will be somewhat different than an author who publishes through a large publishing house, and it will also be different than someone who is working as an indie author, self-publishing their work. None of these things are better, but they are different. In 2016, Flame Tree Publishing, a company that had been publishing themed science fiction, fantasy, and horror anthologies for several years, announced that they were going to open to novel-length works at the end of the year. I submitted my novel, The Widening Gyre, on 10 December 2016. The response window had been claimed to be about four months, but I’ve been submitting works for publication long enough to know that was not going to be the case. But eventually, I just about forgot about it. In March 2018, I remembered I’d submitted the work, and I queried the publisher, expecting that I’d missed a rejection email in spam or something. But I was informed by a helpful staff member that the book was still under consideration. Now, “Thank you for letting me read…” is how pretty much every rejection I’ve ever received began. So when I saw those words, my heart sank a bit. But I knew I had to read the rest of it at some point, so I clicked to open it. In my reply, I tried to play it cool in my response, but the truth was I was practically dancing. My mood had gone from sour in the middle of a bad day with my students to jubilant. Someone liked my book–the same book I’d taken to calling the damned book when discussing it with friends–enough to buy it. It’s really the ultimate “Yes, you are a writer” moment. Next time, I’ll talk about the boilerplate and the contract. One of the most frustrating things is when something amazing happens to you and you can’t tell anyone. For the past week, I’ve been trying to act like business-as-usual when inside, I’m doing 99,000 consecutive HappyDances. I kind of want to go on and on before I reveal it, but that would be mean. So: I am pleased to announce that I have sold my novel, The Widening Gyre, to Flame Tree Press, a UK publisher. The book will be published in “mid-ish 2019” and will be available in both bookstores and online booksellers. I am beyond pleased, here. Yesterday (rather, at 4pm Monday PST, since the publisher is in Britain), the Open Door period opened for Angry Robot Books. And as planned, I sent my submission packet for The Widening Gyre, Book 1 of The Remembrance War. Now begins the waiting. And the pretending it won’t gut me if it doesn’t do well. And the pretending I’m not on pins and needles waiting for that rejection. To be honest, my Victory Condition isn’t that high–frankly, I’ll be happy if I get a request for the full manuscript, even if it’s ultimately not acquired. That said, of course, I’ll be over the freaking moon if it does make it to the end. So I’m hoping Tajen can pique their interest, and that the rest of the crew can hold it. For those who’ve read the beta version, the submission piece ends at the end of Chapter 2, when Tajen has just signed Katherine, Liam, Takeshi, and Ben as his crew. This is the same fragment (plus some more I added in later drafts) that got me accepted to Viable Paradise, so I know it’s not awful. And the Beta process helped me refine it. But man, it’s still such a nervewracking thing, to send your fictional darling out into the world. Now that TWG is out there, I’m continuing work on Book 2, The Ceremony of Innocence (title, as always, tentative), in which the nasty war for Earth begins. I have the basic arc of Book 2 planned, and am now breaking it into chapters and structural arcs. Book 3, The Blood-Dimmed Tide, is just a tiny seed–I know it’ll involve a civil war among humans, but the actual chapters haven’t been plotted yet. Alternate title for Book 3, by the way, for those playing at home: What Rough Beast. Off to the word mines!